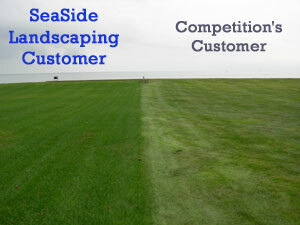 SeaSide Landscaping - Seacoast NH Rye, Rye Beach, Portsmouth, North Hampton, Stratham, N. Hampton, Hampton, and more. Servicing Rye, Rye Beach, Portsmouth, Newington, New Castle, Greenland, North Hampton, Hampton, Exeter, Stratham, Newmarket, Newfields, Epping, Raymond, Seabrook, Hampton Falls, Durham, Dover, and more. Check out our New Turf Care Program for your fertilizer, weed control, and pest control problems. Including ticks, grubs, and more. For those looking to do their projects themselves, SeaSide Landscaping also offers product deliveries of raw materials such as Mulch, Loam, Stone, etc. Call for pricing and details. Integrated Pest Management or IPM combines the use of biological, cultural, physical and chemical tactics in ways that minimize health and environmental risks and economic loss when controlling pests. The IPM Program is an instrument to promote, through education and training, a sustainable approach to managing pests and "to bring about the broadest possible application of the principles of integrated pest management to agriculture, horticulture, arboriculture, landscape and building maintenance, and any other areas in which economic poisons are employed (Chapter 323, Laws of 1998)." The New Hampshire Department of Agriculture, Markets & Food, Division of Pesticide Control, as the legally mandated agency ensuring the safe, scientific, and proper use of pesticides, administrates the Integrated Pest Management Program and the grant funding associated with it. The Program grant application process is open to all residents of New Hampshire including citizens from the private sector, extension offices, trade organizations, corporate organizations, and government agencies who wish to foster Integrated Pest Management projects. SeaSide Landscaping has been trained in these methods and will employ them wherever possible into the program for your individual property. • The IPM Institute of North America, Inc.
Spring is here, time to enjoy your property, rather than be a slave to it. Our crews take great pride in keeping your property looking beautiful. Aerate your lawn to promote heartier, healthier turf.